For a moment today, I thought I found a new product line. I've seen high protein low fat ice cream ProYo pints before on occasion, but today the spot was taken by new light turqoise containers. They almost look delicate. Ok, maybe I'm forcing that word in there. See, ProYo has ditched their "manly" protein supplement looking pints and gone with a new name and new packaging to be more attractive and less confusing. If you think I'm being harsh, I'm actually just paraphrasing their press release. The pints do stand out on the shelf, but it's also kind of boring. What do you think? They have new packaging for their 8 current flavors: peanut butter chocolate chip, mint chip, coconut, salted caramel crunch, dark chocolate toffee, vanilla bean, dutch chocolate and mocha (not shown). There will be two new flavors in chocolate chip cookie batter and cookies & cream. I'm sorry to say that blueberry pomegranate is gone. These faux pints (14oz) were found at Stop & Shop for $4.69 a piece. Wait, I forgot to tell how they picked the name. Ready? Here goes "swell, the next wave of ice cream". Get it, SWELL? swell - wave wave - swell. Ahhhh. Someone is patting themselves on the back for that one. Me? I don't think I really like the name. So yeah, ProYo low fat ice cream pints are now swell. The ProYo frozen smoothie tubes are going away. I think I had more to say but I forget now. I guess my question now is have you had ProYo? Or will you try it now that it's more benign looking? The xylitol part scares me a little but I do appreciate the short ingredient list (granted that list is for the vanilla flavor but it's still pretty short). Well, that's swell! .....I'll see myself out. You never cease to amaze me with the new "healthy" ice cream products you find that are flooding the supermarket shelves. I cannot believe how the #1 selling "ice cream," i.e. Halo, has sparked such an explosion in these pseudo-ice creams. I hope for the sake of your GI system that you did not sacrifice yourself for today's Xylitol ProYo pint or the other day's Erythritol Chilly Cow. I know there are millions of people who love this type of indulgence, so I will apologize to all of those trying to be healthy, but sometimes I just miss a good scoop of custard. Hope you are feeling better, or at least on your way to getting there. Always appreciate the respite your blog provides me. Just remember that the "Halo Top is #1" campaign used some highly selective data to make that claim. They poured over the data, picked a very small and select subset of dates, and then went "hey, our pints sales totaled more than there's in this time frame". It wasn't by number of pints, it was dollar value. (keeping in mind that halo top is more expensive than other brands and for all we know other brands were having a sale that week). And nope, I didn't buy it. There is a little curiosity about how it tastes and how I would react, but it's won't be anytime soon. I'm good just hearing others thoughts for now. You're one smart dude, Dubba. I found that stat about Halo as #1 from either Food & Wine or Bon Appetite. That is some deceptive data, but you definitely saw through their claims. However, they did report Halo had a 2500% sales growth in 2016, which is still incredible (or it just shows how easy it is to dupe people into buying their "guiltless" product.) Oh well. I can't tolerate any sugar alcohols so maybe I am just being the "sour grape" among the massive amount of protein ice cream fans because I can't have it. Thanks for sharing your parsing of the information that I just bought into. And, glad to hear you are doing better (I am the one who you wished "good luck" to in the "!20 hours post," so Thanks! -For all you do. (From Anonymous 1 in this post and the "120"). What's crazy is that in all the stores near me Halo Top is the cheapest pint, all the artisan, local, and premium brands are often twice as much--really, in NYC they sell pints for $12-$18 when they're local like Ample Hills or specialty like Goat's milk ice cream. Halo Top is usually lower than ben and jerry's and is almost always on sale. It reminds me of how in my middle school, the vending machine had Snapple at a lower price than the bottled water(same volume). @Anon: sorry, not saying Halo Top's success isn't amazing, or maybe I should say their PR/marketing/sales/no guilt tactics are amazing. @RG: really? that's weird that Halo Top is consistently below B&J and H-D. I've seen it on sale vs full price as lower but not consistently. interesting! I just tried the Vanilla & Chocolate varieties and I can tell you they are both AWFUL! Texture was not good and they had a bad "chemical" taste. Usually I would try it again the next day but these unfortunately are getting thrown away which is painful to do. I would avoid these but am curious what other people think if you dare to try them. I think the Chilly Cow Brownie Batter is one of the better new ones. To be fair, while Halo Top isn't cheap; it's not all that ridiculously expensive either. At least not where I live. With all things equal (i.e. no special deals on any brand) Halo Top pints are actually still cheaper than Ben & Jerry's, Graeter's and Haagan Daz pints. I work in a grocery store, and last summer even when not on sale, one Halo Top customer would buy 4 pints at a time on any given day. When there was a sale? They'd buy about about 8-12. When you consider that they are company that's less than 5 years old, while HD, Ben and Jerry's et al, have been around since the 70s or earlier, that's still pretty impressive. @Dubba--Yes, it is consistently lower near me--I live in Manhattan--you know what, tomorrow I should take a picture of the insane ice cream pricing at the market right by me, i'll email it to the secondscoop gmail address if you don't mind. You'll be amazed, and perhaps appalled. But you might also enjoy the great variety of small brands and niche pints all located in one spot---we have lower access to the quarts by major brands, but the boutique stuff we're awash in. @Jilly: we appreciate you trying these for us! @Anon: well can I argue price per calorie then? hehehe You have to buy four pints of halo top to equal the calories of one pint of Ben & Jerry's. How about this, maybe I should verify my overall pricing comments as it is easier to get halo top at a lower price nowadays. I just checked the web and Halo Top is $3.99 a pint at Wegman's and $3.88 at Walmart. This is more practical than the old pricing (I want to say that a year or so ago is was like $5.69 a pint which was just ridiculous for what you get). @RG: cool. I wish NYC is closer so I could wander around again. I get that everything's obscenely expensive up North (as that's where I'm from) but that's not the majority of the country. Halo Top uses the same high quality eggs, milk and cream as Ben and Jerry's and Hagaan Daz. 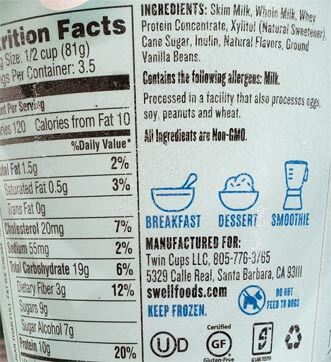 What keeps the calories in check is the cane sugar/artificial sweetener blend. There's also the issue of macros. Many Halo Top flavors are high in protein and fiber, where premium pints have very little of the former and none of the latter. Then there's also the matter of taste : while nothing can beat Ben and Jerry's flavorwise, Halo Top is still very tasty for what it is. The general public can tolerate artificial sweeteners just fine; if they couldn't then the beverage market wouldn't be flooded with carbonated zero or low calorie drinks. Not just diet sodas but sparkling water also. Maybe I'm misreading, but you seem awful defensive of Halo Top..... I would try hitting other stores, no need to pay over 5 bucks for B&J or H-D.
Trust me, I usually don't unless I'm really REALLY craving Ben and Jerry's, haven't had it in forever and it's not on sale at all. Wal-Mart has Ben and Jerry's for 3.48 everyday but I can't always go to Wal-Mart or sometimes don't want to for a myriad of reasons. I wasn't really defending Halo Top. Just offering a counterpoint that seems to be missing here. Your arguement kind of sounded like when old people (the 50+ crowd) claim that only vanilla, chocolate and strawberry are valid ice cream flavors, and stuff like cookies & cream and cookie dough are gross and only popular because people are "brainwashed" to love mix-ins. I know it's all subjective and not that serious, just saying that sometimes things sell for totally valid reasons outside of "trends". Hey, Anonymous that is in high defense of Halo: It is not the artificial sweeteners like Aspartame or Splenda that most people can consume safely that is the problem; it is the Sugar Alcohols (e.g. Erythritol, Xylitol, etc.) that can wreak havoc on the intestinal system of certain people who are unfortunately very sensitive to these manufactured alcohols. Consider yourself lucky if you have never experienced the extreme effects of certain protein-enhanced products (like almost all protein bars and all protein ice creams) that use this as their sweetener. If you want to buy into the diet industry's latest gimmick, go right ahead. Snackwell's anyone? Hello! Alternate opinions are welcome, but please keep in mind that in ten years that I have seen and cataloged several iterations of "healthy ice cream". It's awesome you enjoy it and I'm not trying to take that from you. I totally admit that I have an issue with their "#1 ice cream" claim. Buy what makes you happy!! Snackwells are still around making money, though I personally don't care for them. Erythitol doesn't bother me personally. Xorbital kind of does. People still buy protein bars and shakes and sugar-free pudding (which also contain sugar alcohol) so it doesn't bother everyone. It's kind of like lactose intolerance. I am on some spectrum of lactose intolerance, but if I keep ice cream (low calorie or otherwise) an occasional treat it doesn't bother me. Halo Top sells well because it tastes good is all I was saying. The only thing I "buy into" is what tastes good to me. I came back to this post expressly for the purpose of saying that I tried some Swell Dark Chocolate Toffee today. It was fine at first-- not dark chocolate as I'd define it, but cold and reasonably pleasant. And then I hit what I think was meant to be a toffee swirl. I think this based purely on color, because the taste was unpleasantly metallic and had no hint of toffee flavor whatsoever. It was revolting. Stay away, for the sake of your tastebuds. I loved the pro yo tubes. Any chance we will ever see them again?